Schuco Toys have been around since 1912 but they were initially known for their marching solders and tin mechanical toys. The word Schuco is an abbreviation for the company name which was Schreyer and Co after its founder Heinrich Schreyer. The name Schuco was used on the company's toys after 1921. Schreyer and Co produced many different ranges f teddy bear over the years from walking mechanical bears to miniature scent bottle bears. Far to many to completely list here, so I have limited the distinguishing features to some of their most famous creations. Yes / No bears (1920's) - These bears had a mechanism which when their tail was moved the bear could nod or shake his head. 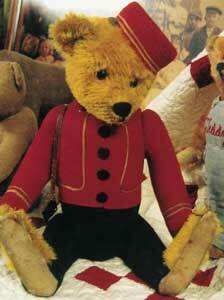 These Schuco bears had Short Mohair and Black button eyes. Some bears where also mounted on wheels. Early Walking Bears - walked via a key wind mechanism and were dressed in felt soldiers clothes. 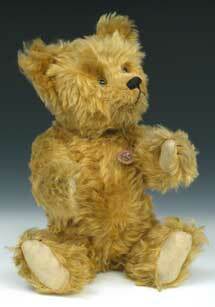 Fully Joined Bears (1925) - Made with bright Mohair, large glass eyes placed close together. They also had a wide head with a vertically stitched nose. Baby Bears (1920's) - these antique teddy bears had open mouths with a red tongue protruding from it. These bears came either with cotton clothes or were undressed. Tricky yes/ No bears (1950's) - They have down turned paws and flat feet. Their muzzles are often shaven too. They were made from tin plate over which they were covered with Mohair. Some of these small bears could be opened and conceal a lipstick, manicure set or compact. Small perfume bottle bears were also produced amongst other novelty decorative bear items. In 1921 the Schuco trademark was first registered. 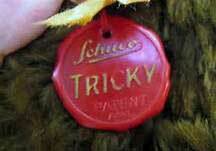 At this time a card label with the word "Schuco" was hung on the bears chest. In the 1950's the "Tricky" range of yes / No bears were produced. These bears would carry a plastic seal with the words "Schuco Tricky".